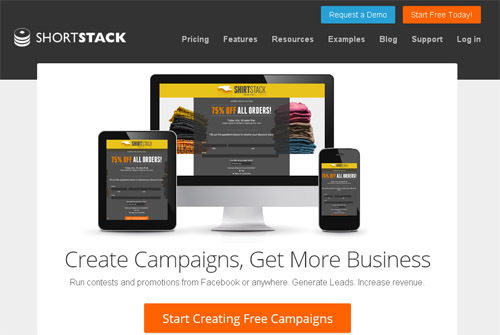 Having most stunning Facebook Tabs is a new branding way to promote your product or business. While excellent ready-made custom designs and variations are available with new tools, why to keep trying your own complicated CSS and HTML codes? Here are some cool apps to create those tabs in most innovative and easiest ways. Every business is having their own custom tabs nowadays to attract visitor’s attention. Below excellent example is of major automotive brand Toyota. With cool images and custom tabs, it quickly grabs attention and engages a new visitor to read, follow and like the pages. After clicking a 'Create contest' button, Site will take you to the test the contest page where you can try your contest working properly. Once a visitor enters the contest and writes a tweet, it automatically posted on twitter and let their followers know about it. 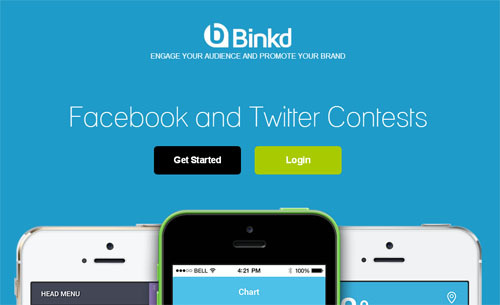 Binkd proves to be the simplest among available contest app. Heyo is yet another app works well for Facebook promotion. 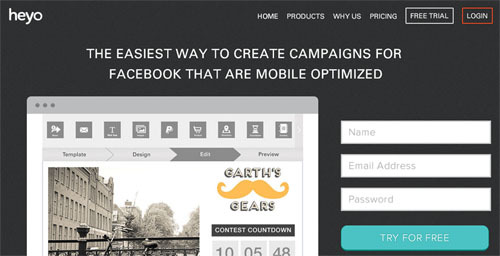 With Heyo you can create custom Facebook timeline promotion. Formerly known as Lujure has best options to stream YouTube, RSS and Twitter feeds. It offers layouts with variable sizes to fit accurately on FB pages. You can also use maps and custom creative forms. It has access to over 30 widgets and apps. It works on a drag and drop technology. 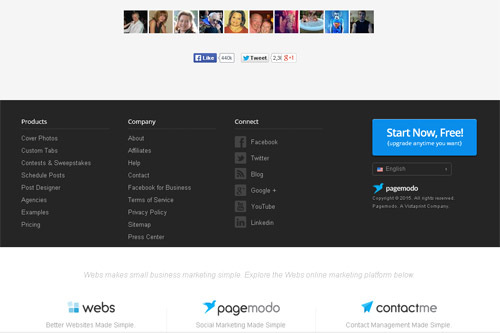 With Pagemodo you can edit FB cover photos, create custom Facebook tabs, design and schedule your posts, contest and much more. It is basically a page builder which assists in simple functions such as colors, layout, fonts to make your coupons, offers, forms, like gates look more professional. 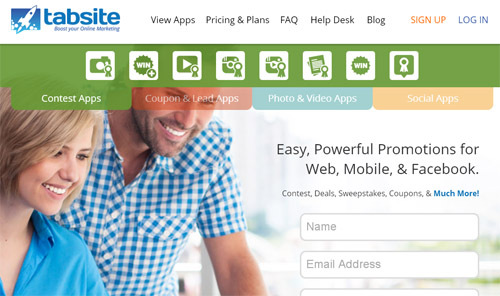 Its overall features include customized templates, image galleries, like gates, twitter feeds, custom forms, video templates, coupons, maps etc. Another do-it-yourself type tab creating service available. TabSite allows you to create a vertical sub-tub system on fan pages. It allows you to integrate YouTube videos, Twitter feed, RSS feeds on page tabs. Its PhotoShow feature allows you create a photo gallery. 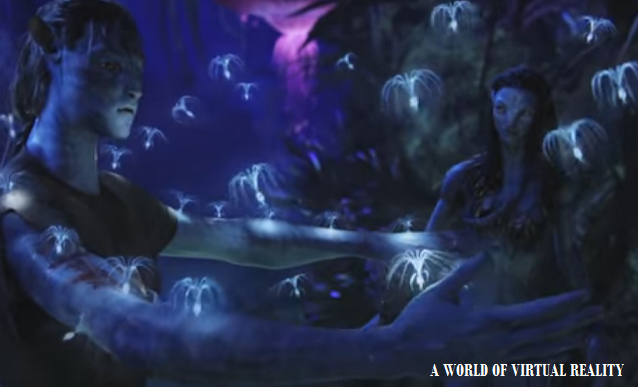 Its user interface is not very easy but overall functionality and results are very good. One of the plus point is it does not require any coding to insert and it has a simple process. It seems they have recently added easy drag-n-build page interface. 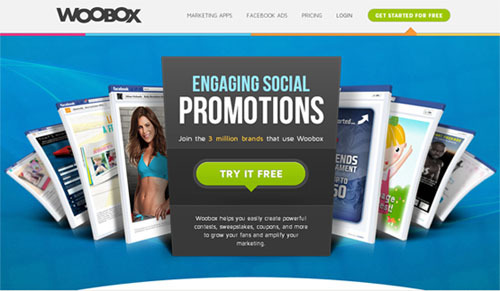 Woobox helps brands to create better user engagement by having promotional apps and custom tabs for FB pages and sites. Some of the positive features of Woobox are it allows social integration very well while running promos, easy collection and exporting of contest data, works well on mobile platforms, can be embedded on Facebook or on sites through iFrames easily and cost effective products.